I used to post updates about writing projects on Thursdays. I haven't had a writing project in a really long time, so I haven't been posting writing updates on Thursdays. National Novel Writing Month is going well for me. I wasn't sure if it was going to. I have so much going on during November, and this is maybe the busiest November I've had yet. I basically kicked all this off doing some of my writing on the dang airplane because I didn't have time to do it any other time. What's really interesting about NaNoWriMo for me is that the pacing gives me an excuse to stop. I'm such a binge writer. When I get into things I just get absorbed and want to finish, and I sacrifice a lot of sleep and attention to do so. NaNo is supposed to press people into short-term sustainable writing patterns to get them writing, push them to turn off the inner editor, incentivize them to write something so they get some practice and have something to sculpt later if they like what comes out. I haven't historically had those problems, but the problem I do have is that I know how much writing takes out of me and I have been reluctant to start a project because I'm already overwhelmed and stressed. But if I write a little bit each day and pace myself, and keep an eye on the word count, and stop when I'm around the goal, I don't have to make huge adjustments to the rest of my life just to write a book in a relatively short amount of time. 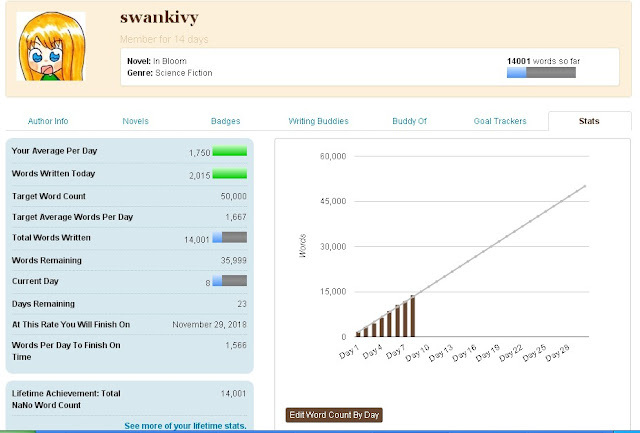 The word count on Day 8 is 14,001. I think this is my first third-person novel. This is a science fiction story set in the distant future. The worldbuilding for it is very quiet, and I'm worrying that the reveals are a little too as-you-know-bob. It's more romantic than I thought it would be--the romance is front and center, and early. I got the main characters to kiss. It took me 12,798 words to get there. I'm not good at naming alien places. Who names a continent "Dry Lace"? I am obsessed with Steven Universe, which has a lot of space lesbians in it. I am also writing about lesbians in space. And yet, it is nothing like Steven Universe. However, I think I've learned more about slow reveals for worldbuilding and character history from watching that show. I'm reusing concepts and names from the short story I'm basing this book on. The short story was written almost 20 years ago. I'm not sure why I feel a loyalty to the names even though I've changed a lot of the specifics of their lives. I cut and pasted a tiny bit of the original text into an interlude and I didn't like the flavor, so I won't do it again. I like the book so far but I'm not super excited about it. Maybe it will totally surprise me soon.